Thought Field Therapy (also called EFT or the Emotional Freedom Technique) is essentially psychological acupuncture. It's used for phobias, depression, fear, panic, negativity, stress, tension, anxiety, nervousness, insomnia, social anxiety and even bereavement. How does EFT work to produce remarkable results from just saying a few words and tapping on meridian points? It seems too easy. 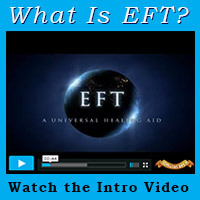 It might be hard to believe, but the ideas behind EFT have existed for thousands of years. EFT is based on the subtle energy system of acupuncture meridians that was discovered by the Chinese about 5,000 years ago. More recently, Albert Einstein told us that everything is composed of energy. Currently, Quantum Theory supports these discoveries. The Chinese application of the subtle energy system took the forms of acupuncture and the internal martial arts. EFT is a new Western application. How does EFT work with subtle energy? Look around and observe how life grows and is nourished by energy. Energy sustains all life, from plants to humans to the creation of stars. Life-giving energy comes in many forms, not just those considered "essential" to life; such as sunlight, water and food. There is also good music, good feelings, physical touch, words of kindness, good company, an uplifting thought, a smile from a stranger--to name a few. All forms of positive energy energize us. This energy is transported throughout our body via acupuncture meridians. Sometimes this energy can be disrupted, and we experience its effects: unease, discomfort and pain. With physical tapping at specific points along our energy meridians, EFT "taps" into our energy system to balance it and keep it running smoothly. How does EFT work at the physical level? The acupuncture meridians act like energy circuits conducting currents of energy. If these circuits are disrupted, emotional and physical discomfort is experienced. Think of energy disruption like a TV with a short in a wire. The effect of this short is a ZZZZT (as described by Gary Craig) on the image seen on TV. The impaired flow of electricity causes the problems with the TV image. When the flow of energy is disrupted in people, some parts of the body experience a shortage of energy and others too much. The physical EFT tapping with the tips of the fingers on acupuncture points on the face and body clears this ZZZZT. In this way the energy traveling through these channels is balanced and flows freely throughout the body. Please note: the strong mind-body connection between illness, emotions and stress is acknowledged by Dr. Gabor Mate in this interview. 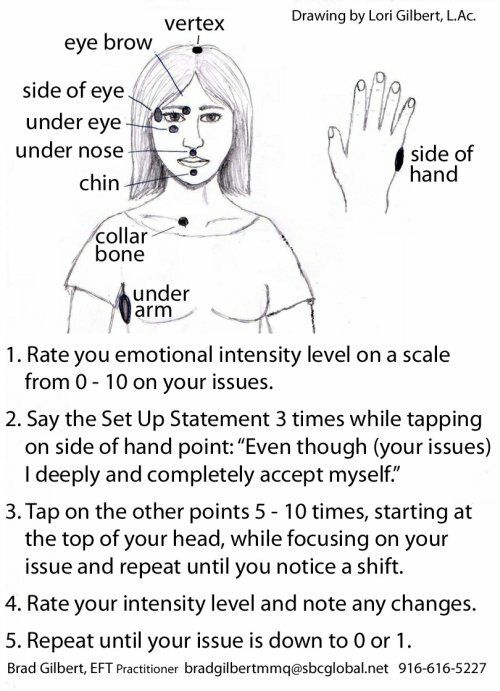 How does EFT work with respect to the tapping points?. These points correspond to acupuncture points on our major meridians. Our finger tips contain points where the three main energy channels (Central, Right Main, and Left Main Channels) meet. According to Taoist Chi Gung Theory, these three main channels come into existence first while still in the womb. Then they create the other acupuncture meridians. The Central and Right Main Channels flow through the right EFT "sore spot" (a point about 3 inches to either side of the thymus gland, where lymphatic congestion occurs) and the right hand karate chop point. These two points can be used interchangeably during the "Set-up" part of EFT. The Central and Left Main Channels flow through the left EFT "sore spot" and the left hand karate chop point. How does EFT work at the emotional level? Our energy meridians form the transportation system that carries energy, or information to its destination. They are information highways. Every day we absorb huge amounts of information. Everywhere we go we collect impressions of our environment, of other people or of our experiences, just to name a few. We are even subconsciously receiving information from our body's inner workings such as temperature, sugar balance and PH levels. How does EFT work to help us process so much information? EFT focuses our attention inward bringing up information associated with what we are tapping on that was hidden from our conscious awareness. Negative feelings provide the link to this information and alert us to energy disruptions. By tapping to release negative emotions, we clear energy blocks before they have time to affect the corresponding physical areas of our bodies and express disease. Because dramatic events in our life, like trauma, are loaded with strong negative emotions, it is often difficult to process and release them all. We may feel overwhelmed and unable to handle them. As a result, many of us developed unhealthy ways to cope with strong emotions. We often stuff them, pretend they are not there or avoid them by keeping ourselves distracted. By not acknowledging them we close the passage out for them to release. In this manner, we keep short circuiting our energy meridians each time these emotions begin to surface as the memory of the trauma gets triggered into awareness. These emotions will keep trying to find a way out because this is how our energy system clears the ZZZZT and fixes itself. How does EFT work to clear traumas and disruptions in our meridians and acupuncture points? When we experience an overwhelming situation, an intense surge of energy in the form of thoughts, emotions, and physical sensations surges through us. The energy meridians and acupuncture points do their best to transport and hold the excess energy generated. Sometimes, this creates an overload to our energy system and cause it to "crash" the way a power surge or too much information can cause a computer to crash. EFT comes in to help release the burden of this excess charge trapped in the memory of the trauma with the tapping techniques. During the EFT tapping, emotions are given attention and acknowledgement and gradually released, until the excess energy is cleared helping to restore balance in our energy system. Another way to understand energy disruption or blockages is to think of a river with many tributaries. If there is pollution or small avalanches that wash debris into the water, the current can continue to flow and carry it away. But if it continually gets washed in there, or if there is a massive avalanche (trauma)--the current won't be able to keep up. Over time stagnation can occur or debris can settle, blocking the water flow. Water backs up in some areas (excess energy) and some areas don't get water at all (energy deficiency). This is equivalent to continual stress accumulating over time or dramatic unresolved emotional trauma hitting us. If these blockages are strong enough, they may even reverse our energy, so that we feel like we are working against ourselves. How does EFT work in unblocking emotions? The "set-up" statement in the Emotional Freedom Techniques allows the emotion to simply be, without resistance or rejection of our self. This acceptance, along with the "tuning in" that occurs when giving the problem an intensity rating, brings the emotion into the present moment. Under these conditions, the emotion can be safely felt and expressed because we are making the distinction that though the emotion/problem may not be acceptable, we are. By focusing on the problem/emotion the underlying energy disruption is activated. In this way, the timing of the tapping coincides with the energy disruption and can help push the energy through, to restore the flow of energy. During the tapping we are able to observe the tapping target as it diminishes and/or changes during the process. This brings clarity in recognizing our self as the observer and not under the control of the emotion. This makes it easier to let go of the emotion. How does EFT work with painful traumas? Emotions are packed with energy. It is easy to feel their "charge" (if we allow it), whether it be positive or negative. With EFT it is not necessary to submerge one's self in these strong currents of unreleased pain. It is not recommended we jump into the deepest part of the pain to release the charge. The intensity of the charge surrounding the issue is first diminished before continuing step by step with the other emotions and going deeper. The approach is like peeling an onion. We start with what is on the outside and go layer by layer. Please note, sometime we are unexpectedly taken into the center of a deep trauma or emotion. These new memories or emotions may take us by surprise, having forgotten about them or believed they were already resolved. This process can happen so quickly we are not able to "sneak up on it" gradually. In this case, continuous, quick tapping through all points is done until the emotional energy is released. Emotional Freedom Techniques (EFT) uses the acupuncture meridians in an easy-to-learn tapping process. First choose an issue that you want to work on. The second part is the Setup. While tapping on the Karate Chop (KC) point on the side of the hand in the soft area between the wrist and the knuckle by the baby finger say the “Setup Statement” a minimum of three times. Even though I have this fear of water, I completely love and accept myself. Even though I had a bad day at work, I completely love, accept and forgive myself. After completing the setup, just tap down the body using the tapping points listed below to guide you. As you tap, use a reminder phrase such as, “This fear of water”. The EFT process works best when you stay focused on what you are tapping on. Also, pick a short, specific event rather than general trauma or events that spanned many years. CB: collarbone, tap gently with your fist to the left of the heart and upward about one inch. Sometimes called "the sore spot" because it will be tender. TOP OF HEAD: tap gently on the crown on the head using several fingers. Repeat until you are at least at a one (1). Now say the reminder phrase using “remaining” and tap down the body. Repeat if necessary. Some issues are very deep seated and take a bit longer to clear. An amazing demonstration on young children (subtitled). Have Additional Advice on Effectively Using EFT? Do you have a success using EFT? Please share your techniques and experiences with us! Your information will appear exactly the way you enter it here.